Here is an example of my vision board, be creative! As the New Year quickly approaches, some of us start to think about “New Beginnings”. The new beginning that means a fresh start to so many different things. Some of us may began to think about future goals, others call them resolutions, but any way you look at it we have a common intent to somehow be better than what we were the year prior. 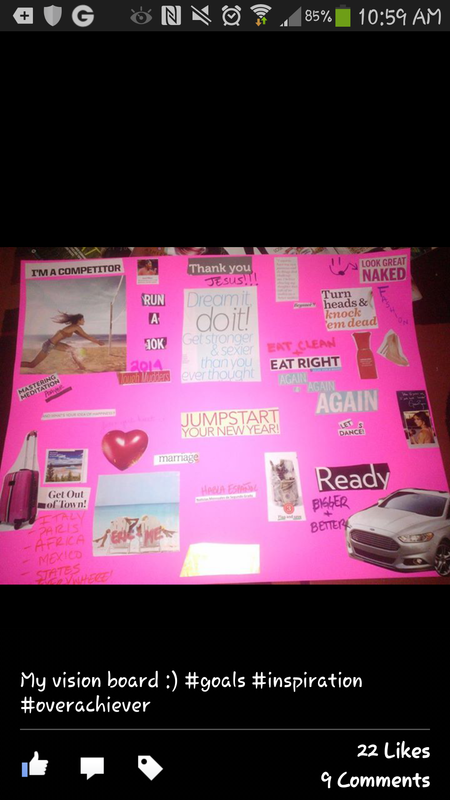 I personally decided to make achieving my goals as easy as possible and that was by creating a vision board. I chose this route instead of writing my goals down on a piece of paper that I won’t be able to find by President’s day because I needed a daily reminder of the promises I made to myself. I took the time out of my busy day to actually look for pictures or words in old magazines to physically represent and remind me daily of what I want to achieve. This way it actually means something! I then hung my inspirational artwork in my bedroom above my bed so that every day when I try to conjure up some type of lame excuse as to why I can’t do something, it reminds me that I can. I once heard someone say that GOD would not plant a seed (idea) and not provide you with the water (resources, funds, strength etc..) to help that seed grow into a beautiful flower…. (insert winky smiley face here) What goals do you have for 2014? How are YOU going to achieve them? Nobody can achieve your goals for you, besides that would take all the fun out of it and then there would be no sense of accomplishment! Place your ideas and goals on your New Year’s vision board WITHOUT fear, then proudly take pictures of you achieving them and boldly post them here!!! Nice, Good Luck with your blog Tanishia!! !